It's got the beauty, but does it have the brains? If you like the idea of fitness tracking, but don't like the cheap rubber straps of Fitbit et al, the Frederique Constant Horological Smartwatch Worldtimer is for you. Quite simply, this is the most elegant (and most expensive, costing £1,120) fitness tracker we've ever reviewed. We first saw the Frederique Constant Smartwatch at Baselworld in 2015 and it's been a massive success for the Swiss watchmaker since. The Worldtimer Edition is the latest addition to the range. It's a beautiful piece (and if you think otherwise, you're wrong), sporting a 42mm rose gold plated steel case, paired with a deep navy blue alligator leather strap. A convex sapphire crystal dome protects the refined navy dial, narrow hands, and Roman numeral hour markers. It's got classic appeal in bucket loads. It's also water resistant to 5ATM, although you wouldn't want to get it wet on purpose, but you'd be safe in the knowledge that if you have to jump off a yacht in a tux and dress watch - it'll survive. The main dial tells the time, obviously, and the small sub dial at 6 o'clock denotes the progress towards your activity goal and the date. It's a very comfortable watch. It sits nicely on the wrist thanks to the rounded edges and soft leather strap. It's also not too heavy, making it a pleasure to wear all day. Err, what is a Horological Smartwatch? This isn't a smartwatch in the classical sense of the word - it's no Apple Watch competitor. But it is more intelligent than what Frederique Constant, and most other Swiss watchmakers are used to. The Horological Smartwatch Worldtimer packs an MMT-285 calibre movement powered by MotionX platform. It's capable of everything other MotionX-powered watches can do, namely counting steps, estimating calorie burn, and tracking sleep. As well as the fitness tracking smarts the Worldtimer can also, as the name suggests, keep track of several time zones. The time zone is synchronised with your smartphone, so it'll automatically update depending where in the world you are. You can also select an additional time zone that can instantly be displayed on the watch by pressing the crown three times. It's useful for frequent travellers. This functionality is also coming to other MotionX watches via a firmware update. Back to fitness tracking. There's no GPS or heart rate sensors on board, so this is essentially a step counter. A really expensive step counter. We found the step counting was accurate and reliable. We wouldn't put much trust in the calorie burn, distance, or sleep tracking (you wouldn't want to wear this lovely timepiece in bed, anyway). For more detailed information about your stats, the MotionX-365 app is available on iOS and Android. It's a simple app which presents your history in easy to read graphs. We didn't have any connection problems during our review, and found synchronising the watch was a quick and painless experience. It's pleasing to use, but perhaps a bit too simple in places. 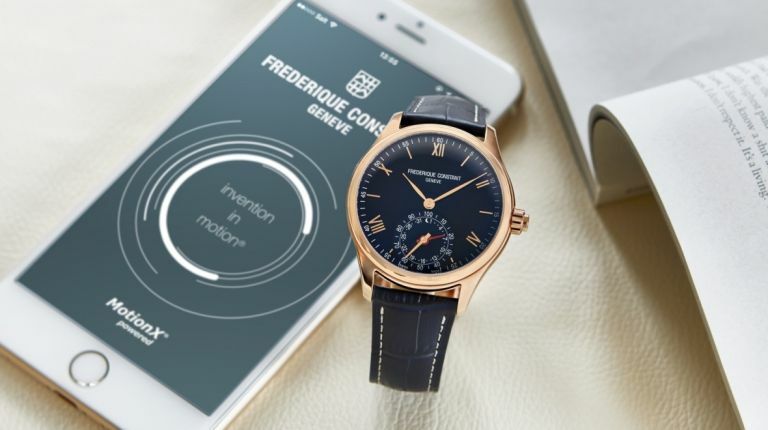 There are no problems with battery life either, as the Frederique Constant Horological Smartwatch should keep running up for two and a half years before the watch battery needs replacing. The Frederique Constant Horological Smartwatch is the most expensive and most sophisticated fitness tracker we've ever reviewed. It looks great, and does a perfectly good job at step counting. Of course, it's not as smart as more advanced fitness trackers and completely unsuitable to wear while exercising, so in the eyes of many may seem completely redundant. But if you want to keep track of how many steps you take in your Mark Margeno suit, this is the only option, that is, if you can swallow the asking price. You can buy the Frederique Constant Horological Smartwatch Worldtimer in the UK exclusively from WatchShop.com. Why not try the best smartwatch on for size?